Hello again! Is everyone in a romantic mood for next Sunday? 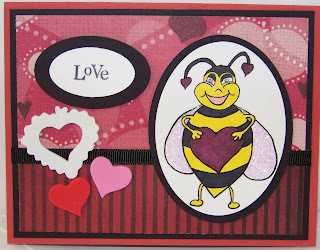 Here's another lovey card for inspiration! This is my weekly DT creation for Sunshine's Stamps. You can find this little bee here. I used the sketch from the Corrosive Challenge Blog Challenge #50 this week. Material are image by Sunshine's Stamps colored in with Bic MarkIts and Stickles. Misc foam hearts. Sentiment is PTI Mixed Messages. Paper is misc DP and SU Ruby Red and Basic Black. Ribbon is from my stash. Aww, that bee is just too cute! Beautiful card.Thanks for playing with Corrosive challenges this week. Isn't he sooo cute?! Love your colors, and the wings are super cute. Hugs! Great design work- love how you combined patterns. Love the bright colors - super card! I have been seeing this bee everywhere...super cute!